GOVERNMENT is mulling new laws to crush demonstrations before they turn violent, President Emmerson Mnangagwa said yesterday. 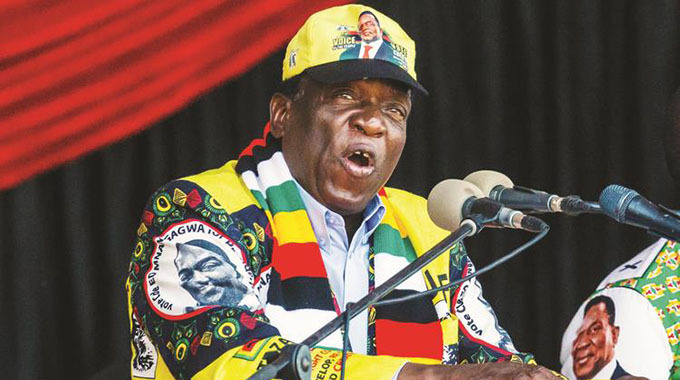 Addressing the 111th Zanu PF central committee meeting in Harare yesterday, Mnangagwa said his government was gearing to ensure that protests which rocked the country in mid-January would never happen again. “I am assuring the party that government is putting in place measures to ensure that the illegal, criminal and divisive elements of January 14 to 16 disguised as protesters will never happen again,” he declared. Mnangagwa’s chilling statement comes just a month after he warned the opposition, labour movements and civil society that his government would not hesitate to send in soldiers to thwart any future demonstrations against his government. He told the meeting that his team was efficient in dealing with dissenting voices. “Those who become violent and destructive, destroying property and the lives of our people, government says no and it is no and we know how to implement no,” Mnangagwa said. The European Union, Britain and the United States, among other countries, have condemned Mnangagwa’s regime for deploying the military, which killed 17 unarmed protesters in cold blood, according to human rights groups. The West decried the violence and said Mnangagwa’s efforts to promote investment and to deepen international partnerships could only be successful if his administration pursued reforms that included “freedom of assembly, association and expression”. The EU ambassador to Zimbabwe, Timo Olkkonen, on Monday said the bloc would not ignore the human rights violations and warned that further violations were destroying goodwill and a setback to the country’s recovery efforts. Early this month, the United States extended sanctions against Zimbabwe by a year. A defiant Mnangagwa said his actions were in line with the law, which provides for the protection of property and rights of Zimbabweans. “My government remains committed to guaranteeing the safety of all its citizens and ensuring that any democratic rights are enjoyed within the strict confines of the law. That’s why there is a government in the country. That’s why there are laws in the country,” he said. Mnangagwa noted that his party members could have unleashed chaos and massive damage if they had reacted to the violence. “I commend the party members for showing sober restraint against immense provocation and attack during that unfortunate incident,” he said.